Ceramics is a material indispensable for ultra-precision machining because of its extremely small thermal expansion coefficient. Sodick owns technologies for producing ceramic products that support high-precision positioning such as high-rigidity machine structural components. Sodick machines have light-weight and high-rigidity structure thanks to their key components made of proprietary ceramic products (FINEXCERA series). 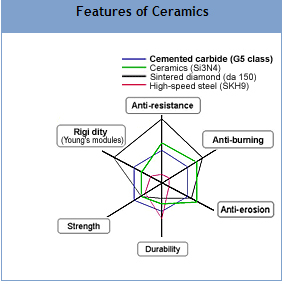 Ceramics offer a wide range of advantages when compared with other materials such as steel or plastic. Ceramic is light and yet hard, stable and resistant to ageing, it doesn't rust, has a high electrical resistance, and scarcely changes at all under the effects of heat: its coefficient of thermal expansion is one third that of cast iron. In other words, ceramics are ideal for EDM. In order for these hi-tech materials to be applied economically, Sodick manufactures them in-house. 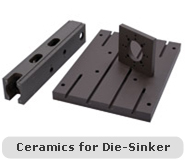 A great number of Sodick components have already been manufactured from ceramics. 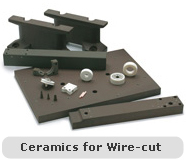 In Sodick wire-cut machines ceramic components are used in critical areas such as the upper & lower arms, base plate and pedestals. 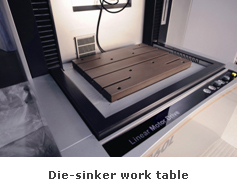 In Sodick die-sinker EDM work table and Z-axis* quill are the major parts made from ceramic. Ceramic being highly resistant, completely isolates the work-piece and prevent any leakage current flowing from the body of the machine. Such work-piece isolation helps to detect optimum spark gap and maintain the servo voltage accurately even at the high frequency low current skim passes. 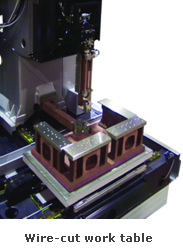 A CNC unit, with a temperature rise by 1ºC, the length of a 1-m-long steel material expands by 10 µm, and when a work piece is machined on a wire-cut electrical discharge machine having key components made of steel, the center position of the wire shifts from the originally desired position. In contrast, the thermal expansion coefficient of ceramics is one-third or less that of steel. Sodick's research activities led to a conviction that ceramics was the best material for the arms of an electrical discharge machine, but no companies produced ceramics for the application at that time, and therefore, Sodick embarked upon the production of ceramics for electrical discharge machines on its own.